On Sunday, February 18, hundreds gathered in the University of Redlands Casa Loma room, where red lanterns glowed, the guzheng (a.k.a. Chinese zither) hummed, and the warm smell of chow mein was omnipresent—the makings of a fantastic Lunar New Year celebration! University of Redlands Asian Students Association (ASA) spent over four months preparing a jam-packed event that covered a large span of Asian culture. Niki Binondo, ASA’s recreation chair, and Teddy Hansen, the social justice chair, spearheaded the planning of the event in association with Asian Studies Professors Hongwei Lu, Lifan Su, Masako Nunn, and Sara Thompson, as well as former professor Ayano Ginoza. According to Teddy, one of the main goals of the event was for it to be educational, and it certainly was! The event started with a PowerPoint presentation on the origins of the Lunar New Year (this year is the Year of the Dog) and a fun video depicting a race of the Chinese zodiac animals. The evening then launched into a series of incredible performances, beginning with University of California Riverside’s drum group, Senryu Taiko. The group played a number of invigorating pieces, filling the room with a lively and festive spirit. The event also showcased the proficiency of the Chinese and Japanese students at the University of Redlands. Both language groups performed humorous skits that integrated modern Chinese and Japanese slang and pop culture references that left the audience laughing. Professor Su, who had written the Chinese skit, was the star of multiple performances. She elegantly performed a traditional Chinese dance. 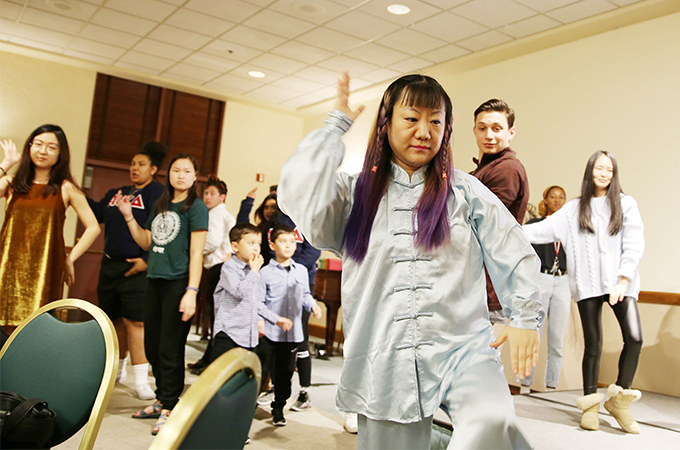 She also called upon audience members to do tai chi with her, and many seized the opportunity, creating a harmonious group that followed her graceful movements in a beautiful display of cultural appreciation. During the intermission, attendees had the opportunity to soak up as much Chinese culture as they could through a wide array of activity booths presenting topics such as calligraphy, Chinese toy games for children, and even zhezhi (also known by the Japanese word, origami). For each booth visited, participants received a raffle ticket for a chance to win prizes. Between these activities and the performances, there was certainly no shortage of entertainment! What made the event so enjoyable was the diversity of participants and their celebrations. 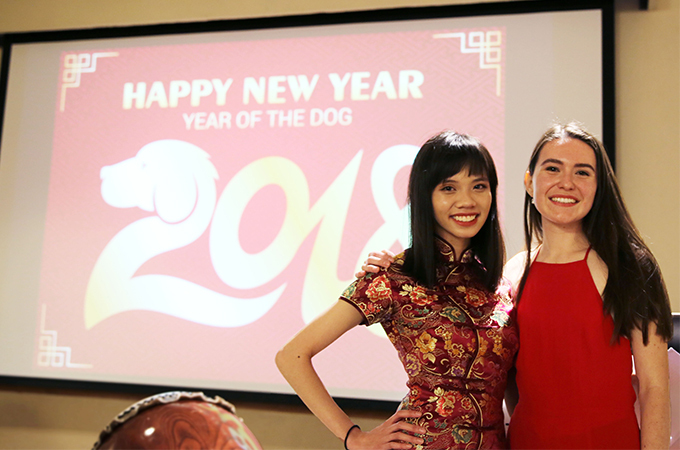 As a student of Chinese at the University of Redlands, I learned a lot about the New Year celebration and its cultural weight, giving me a greater appreciation for the occasion. Teddy and Niki put on a fabulous event that was both educational and entertaining, and I personally cannot wait to attend next year’s celebration of the Year of the Pig!